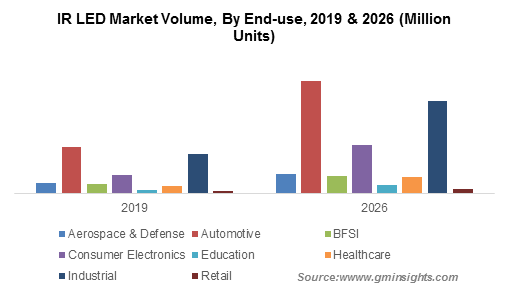 Consumer Electronics « Global Market Insights, Inc.
Owing to the broad expanse of application arenas, power electronics market, one of the most pivotal verticals of the electronics and media sphere has been estimated to garner substantial returns in the ensuing seven years. The extensive popularity of this business space can be attributed to its massive deployment across the automotive, industrial, consumer electronics, defense, aerospace, renewable energy systems, and ICT sectors. Furthermore, the competitive spectrum of power electronics market has been witnessing the unveiling of exceptional and innovative products equipped with emerging technologies, specifically developed for particular end-use disciplines. The upcoming market players have been vying with the existing leading firms to build a robust presence in the industry. For instance, Navitas Semiconductor Inc., an emerging power electronics industry player based in the U.S., has recently launched the world’s first commercial Gallium Nitride (GaN) Power Integrated Circuit which enables highly energy-efficient and low-cost power converters. Such dynamic product innovations are set to significantly alter the growth landscape of power electronics industry in the forthcoming years. For the record, Gallium Nitride power ICs are considered as an emerging technology that has propelled the power electronics industry to enter a new era of imaginative topologies, new controllers, materials, devices, and magnetics. 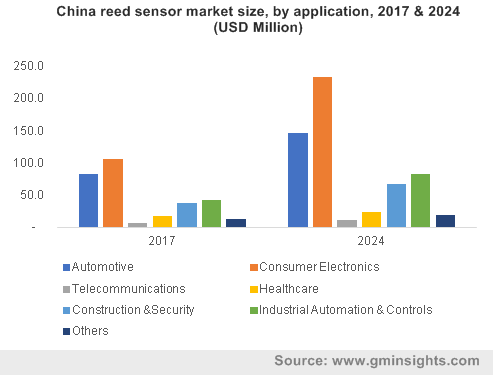 They have been increasingly replacing the conventional silicon devices who are comparatively slower and inefficient, consequentially, further stimulating the growth of power electronics market size which was pegged at USD 34 billion in 2016. Concurrently, the ever-growing governmental thrust across various nations to adopt renewable power sources in residential and industrial sectors to reduce air pollution, lower particulate matter, slash CO2 emissions and suppress the fossil fuel depletion, has had a favorable impact on power electronics market growth. To cite an instance, the Indian government under its Jawaharlal Nehru National Solar Mission has resolved to attain an ambitious solar power capacity of 100 GW through rooftop and large-scale grid-connected solar power projects by 2022. Undoubtedly, these humongous projects would require AC/DC converters and switching systems to work seamlessly, which would, in turn, boost the expansion of power electronics market size. Meanwhile, the escalating costs for setting up new production plants and the rising complexity of manufacturing procedures have restricted the advancement of upcoming players in the power electronics industry. 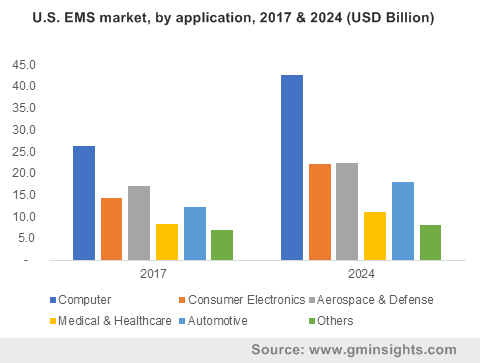 Add to it, the power electronics industry is likely to face quite a few more challenges as the prominent market players have been plagued with space and security concerns which would impede the growth prospects of the industry in the immediate future. It would be prudent to mention that the major industry players have been joining forces with other firms, universities, and research institutes to erect smart grids that would hopefully provide solutions to the aforementioned challenges. One of the foremost firm partaking in power electronics market, Enercon Canada Inc. for instance, has recently announced its collaboration with Hydro-Quebec research institute (IREQ) to interpret the impacts on grids of new electronic wind-turbine control systems. The partnership aims at blending ENERCON’s mastery of energy converters with IREQ’s extensive experience in simulating wide-scale wind power grid integration. The Asia Pacific region is anticipated to be one of the most lucrative territory for power electronics market, given the wide-ranging deployment of the products across a multitude of business verticals. The economic boom in the region has resulted in increased disposable income in the middle-class households which has enabled them to purchase a greater amount of luxury electronic goods and systems. To add to it, the power losses and consistent current fluctuations, especially in manufacturing and industrial sectors of the region, have necessitated the deployment of power electronics systems such as UPS, inverters, and power regulators. Given the wide-ranging adoption of emerging power electronics technologies on the global scale, it would be prudent to note that these systems shall acquire a prominent role in the growth of diverse industries such as heavy machinery, alternative energy, construction, oil and mining, and household equipment. 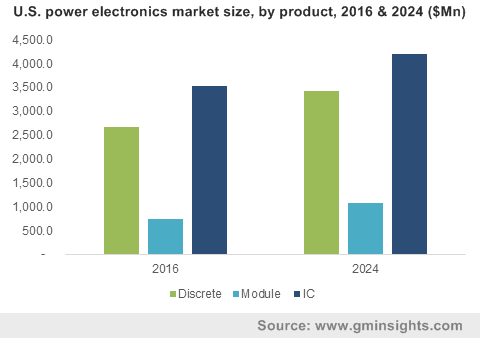 According to a research report compiled by Global Market Insights, Inc., worldwide power electronics market size is slated to exceed USD 45 Billion by 2024. This entry was posted in Electronics and Media and tagged Consumer Electronics, Discrete, IC, ICT, Module, Power Electronics Market, Power Electronics Market Analysis, Power Electronics Market Forecast, Power Electronics Market Report, Power Electronics Market Research, Power Electronics Market Share, Power Electronics Market Size, Power Electronics Market Trends. Increasing adoption of technology in the security vertical and the confluence of organizations to meet authentication standards has added a renewed dynamism to biometrics market. With the biometrics technology having marked its presence across the security landscape, it is now rapidly penetrating its way into consumer, government, and industrial systems. Based on the concept of statistical analysis of biological data, the biometrics technology is proclaimed to be less prone to cybercrimes and hacking. Recently, Mexico’s National Banking and Security Commission has announced a new regulation in the country that would require all the banks to deploy fingerprint scanners for the clients by 2018. Another instance is of FacePhi Biometria, where the company is seen signing deals to bring its selfie-based authentication system especially in the financial sector. Similar moves are likely to materialize in the coming years, in turn, propelling biometrics industry size. 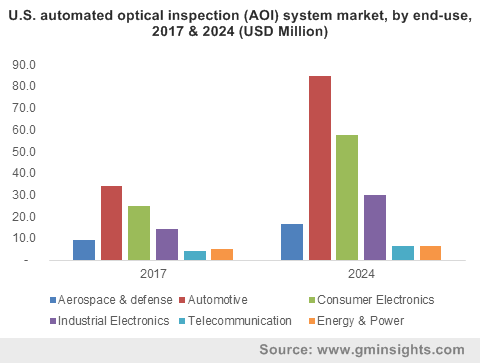 Global Market Insights, Inc., claims that biometrics market will exceed USD 50 billion by 2024, having been pegged at USD 12 billion in 2016. High acceptance of biometrics in various verticals such as mobile banking and other financial services has further favored the growth of biometrics market. As the cybercrimes and identification errors are captivating the industry verticals, there has been a significant upsurge in the adoption of biometrics to ensure data security and privacy. Lately, there has been a plethora of fraudulent cases and data breaches in the financial sector. JP Morgan Chase for instance was one of the major victim, where the hackers accessed the critical data of approximately 83 million customers. Such potential threats of data breach have led to greater demand for biometrics technologies in the banking & finance sectors. As per the report, biometrics industry share is set to gain lucrative avenues from banking and finance sector, projected to register a healthy growth rate of 22% from 2017-2024. Apart from this, biometrics industry is also likely to demonstrate noticeable growth in healthcare, transportation, consumer electronics, and defense services. In fact, the transportation application within biometrics market is estimated to be the highest revenue contributor in the coming seven years. With the significant expansion of its vast application arena, it is quite evident that biometrics technology is gaining lot of popularity as it works on identification of individuals’ biological information. This technology uses physiological and/or behavioral characteristics of people to authenticate their identity. As every individual is unique, this technology uses separate identifiers such as face recognition, fingerprint, palm veins, hand geometry, DNA, iris recognition, voice and retina. Many companies have adopted these techniques to improve the security features. For instance, Samsung and LG have incorporated iris scanners into their smartphones on a wider scale. The voice recognition technology is also seen gaining considerable traction in the mobile banking and commercial sector. 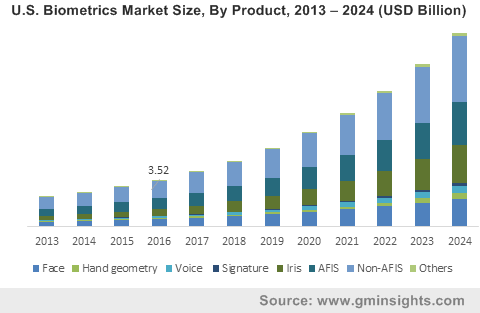 The voice recognition segment of biometrics market is expected to register a CAGR of 22% over 2017-2024, claim estimates. Over the coming years, biometrics industry is expected to witness several technological advancements that will make authentication more secure and convenient. Below mentioned are the three trends that will strongly influence the industry growth. Mobile payment is touted as the future of financial transaction and is thus getting incorporated with biometrics to provide a strong security interface. Governments and businesses are vigorously looking for reliable authentication devices such as mobile biometrics to speed up human identification processing, in turn, providing a commendable impetus to biometrics market demand. Such technologies running on personal smartphones are sure to offer biometrics market the opportunity of clocking excellent growth rates in the ensuing years. With the rapid growth of online shopping, online payment methods are slated to be subject to a lot of threats. The biometrics technology is expected to do wonders in this segment as accessing of user accounts through iris, facial recognition and fingerprints could go long way in ensuring a secure login than regular pins and credentials, validating the contribution of e-commerce in the growth of biometrics industry. One of the biggest biometrics market trends to watch for will be the adoption of this technology parallel to the massive expansion of IoT. IoT being the biggest emerging concept for both businesses and consumers undeniably requires a robust security spectrum to protect critical data. In response to this, in the coming years, the global biometrics market will witness a remarkable upsurge with the technology being integrated in a wide variety of IoT applications ranging from smart homes, banking, healthcare, and automotive. With the advancements and evolution in the tech space, identity management and security are certain to be the top-notch priorities of the businesses. Taking into account this trend, it is unarguable that biometrics industry is set to witness a profound profitability quotient in the ensuing years. This entry was posted in Electronics and Media and tagged AFIS, Banking & Finance, Biometric System Market, Biometrics Industry Report, Biometrics Market, Biometrics Market Forecast, Biometrics Market Growth, Biometrics Market Research, Biometrics Market Size, Consumer Electronics, Defense Services, Face, Global Biometrics Market, Government, Hand Geometry, Healthcare, Iris, Mobile Biometrics Market, Non-AFIS, Signature, Transportation, Voice.